550-horsepower shooting brake is not your mother's station wagon. Combining practicality with absurd levels of performance, the CLS63 AMG Shooting Brake has just been officially released by Mercedes-Benz. In brief, it places the engine, aero kit and other performance components from the CLS63 four-door into the wagon body-style of the recently released CLS Shooting Brake. The svelte wagon is thus packing a 5.5-liter twin-turbo V8 with 518 horsepower and 516 lb-ft of torque. But if that&apos;s not enough, the special "Edition 1" model ups those figures to 550 hp and 590 lb-ft.
That means you can take your friends and their luggage on a romp from 0-62 mph in 4.4 seconds (4.3 in the more powerful Edition 1) and on to a top speed electronically limited to 155 mph. The turbocharged eight-cylinder engine is mated to the MCT seven-speed automatic transmission boasting dual clutches, launch control and four individual transmission modes to adapt to the driver&apos;s temperament. At the touch of a button, the AMG Ride Control suspension can also be switched between three modes, as can the 3-stage stability program. The widened front track has been optimized for the electromechanical steering and features variable power assistance that adapts to the different suspension modes. AMG high-performance brakes, 360-mm discs all round, come as standard, but for those in need of even more stopping power, ceramic composite brakes are offered as optional equipment. Putting power to the tarmac is a set of 19-inch titanium-grey lightweight alloys with a split-spoke design, with 5-spoke and 10-spoke design alloys available for a more individual touch. 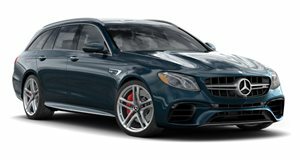 Exterior highlights of the high-performance wagon include the AMG radiator grille with single slat, an AMG-specific hood design and rear apron with twin chromed tailpipes, and high-performance LED headlamps. Leather and carbon fiber adorn the cabin, but for those interested in performance, the Edition 1 package not only provides a more potent engine set up but also an interior by Designo, the company&apos;s in-house customization division. That means platinum white pearl trim with metallic finish for the sports seats and trim, as well as velour floor mats. Optional extras include a Bang & Olufsen surround sound system, a rear differential and a carbon fiber trim package. The new CLS63 AMG Shooting Brake will hit European dealerships in October.